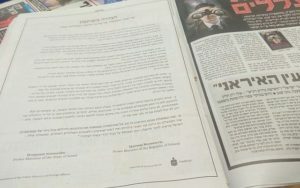 A Polish foundation with ties to the government in Warsaw has been placing full-page ads in newspapers around the world, including in Israel, publicizing the joint statement on the Holocaust issued by Poland and Israel last week, with translations made by the Polish foreign ministry. On Thursday, a Hebrew version of the document appeared in the Haaretz and Yedioth Aharonoth dailies. The day before, the ads could be found in important newspapers in Germany and the UK’s Telegraph newspaper, in German and English respectively. 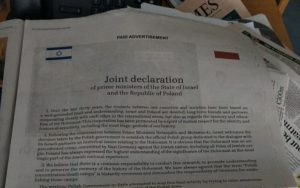 The appearance of the ads triggered criticism in Israel, with some people arguing that they were proof the Israeli government, by agreeing to issue the statement, had handed Poland a PR victory in its battle to portray Poles primarily as victims of Nazism rather than accomplices in committing atrocities. Critics say the joint Polish-Israeli agreement downplays the role of many Poles who willingly cooperated with the Nazis. Critics charged that the statement was historically inaccurate in comparing anti-Semitism with “anti-Polonism” and that it gave a kosher stamp to the Poles’ skewed narrative of the Shoah. The joint declaration, signed simultaneously on June 27 by Prime Minister Benjamin Netanyahu and his Polish counterpart Mateusz Morawiecki, ended a diplomatic standoff over a Polish law that criminalized accusing Poles of complicity in the extermination of Jews during World War II. 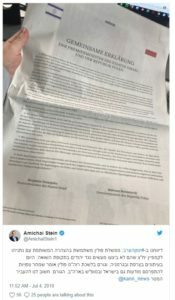 The full-time ads reproducing the statement in its entirety are being placed in “the world’s largest daily newspapers,” according to the PKO Foundation, which paid for the ads. The PKO Foundation is an affiliate of Bank Polski, one of Poland’s leading financial institutions, which has close ties to the government. It is unclear whether the PKO Foundation placed the ads of its own initiative or whether it did so at the behest of the government. The PKO Foundation, founded in 2010, “implements numerous initiatives for the public good, including in the field of education, upbringing, social assistance, protection and promotion of health, arts and culture, and environmental protection,” according to its website. The translations of the document used in the ads — into German, English, Spanish, French and Hebrew — were done by the Polish Foreign Ministry. The Hebrew translation done in Warsaw differs slightly from the version the Prime Minister’s Office in Jerusalem issued last week. The changes were minor and it was not immediately clear why they had been made. The Prime Minister’s Office and the Foreign Ministry did not respond to requests for comments. Yaakov Nagel, one of the two Netanyahu confidants who secretly negotiated the agreement with the Polish government, earlier this week firmly rejected any criticism. The Poles, too, have expressed satisfaction with the statement. The influential leader of Poland’s ruling Law and Justice party, Jaroslaw Kaczynskiarty, last week said the joint declaration declaration “fully confirms Poland’s position” on Germany bearing the sole responsibility for the Holocaust. More than 6,800 Poles are recognized as Righteous Among the Nations who risked their lives by helping rescue Jews during the Holocaust, the highest number of any nation. However, Poland had by far the largest Jewish community in Europe before the war, only 10 percent of which survived. At the same time, many Poles were rabidly anti-Semitic and actively collaborated with the Nazis or killed and robbed Jews themselves.